First A-Skills, now Krafty Kuts. I am a lucky girl. Coming from way down-under I would have only dreamed of DJing on the same line up as these funky-break icons. It was an opportunity that seemed a world away. Now, living here in Europe I realise that by immersing myself in what I love to do, the opportunities are open to me. I am in the playground of people with like minds, and everyday i’m inspired by the people I meet. Over the winter in Chamonix I have been working alongside Le Vert Hotel in conjunction with my involvement with The Daily Dump Snow Report. Le Vert Hotel is an establishment born just over 6 years ago and run by a crew of cool-cats who love the active-mountain lifestyle as much as the love to share it with their guests. If you like your accommodation hip, funky and laid-back, then it’s the place to stay when you visit Chamonix. especially if you want something that feels like a home away from home. 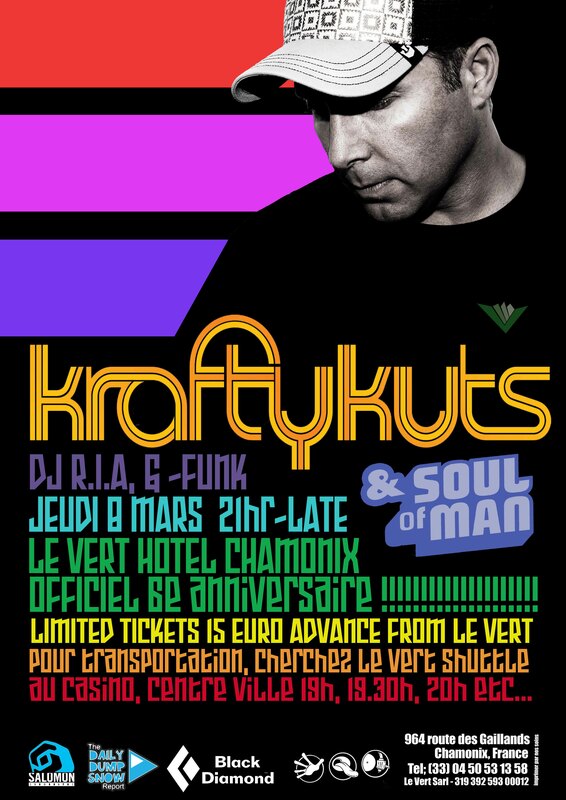 Tomorrow it’s Le Vert’s 6th Birthday and they’re pulling out the party poppers to throw down a soiree that is sure to tear the roof off with none other than the multi-award winning DJ Krafty Kuts. Krafty Kuts is a true international superstar, headlining clubs and festivals to sell out shows. Returning to Chamonix after a decade he’ll be rocking Le Vert’s intimate space to a small capacity of only 200 lucky people. He’s the master of the mash ups and the king of the grooves so we’re expecting to hear him slamm the funk, hip hop, breaks and drum & bass all with that non stop ‘Instant Party’ vibe….